On January the 12th photography social marketplace www.bescouted.com has launched a huge update for their website that they have been working on for the last five months after securing pre-seed investment from Startup Highway. This update is a backbone process of BeScouted. New functionality under the working title „Creative Projects“allows anyone to find team members for implementation of any photography idea when specific, custom made images are required for business or individual needs. “The main difference from existing solutions is that we have reversed the search process meaning you don’t have to contact all potential candidates yourself by writing to them separately. 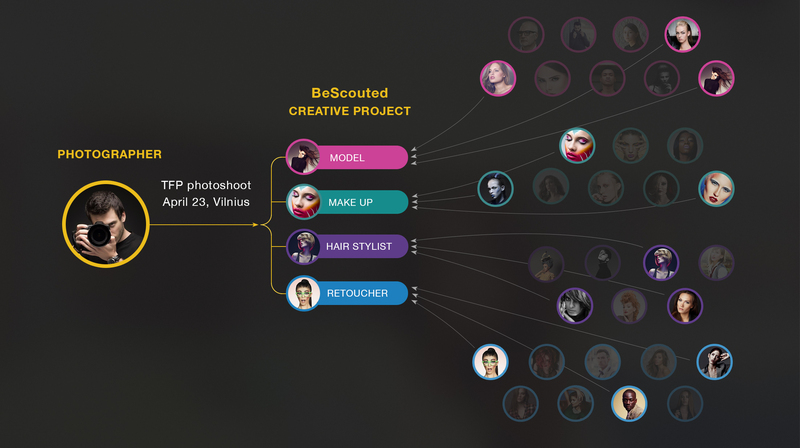 All you do now is create your project and all parties that are interested and available can apply to it,” says Deividas Leilionas, founder of BeScouted. Photographic images being ubiquitous in posters, online advertising, magazines, packages, social media networks means increasing demand for such a service. Photography became so popular that it is actually driving many sucessful web companies like Instagram, Pinterest and many others. Almost all of those images that we see each day are made by professionals working through agencies or semi pros acting as freelancers. And organizing this process manually takes enormous amounts of time and effort. With „Creative Projects“ anyone can initiate a project and cast for photographers, models, make-up artists etc. for implementation of the particular idea, saving dozens of hours of manual input on any given project. In the future BeScouted will have location tagging and many more other useful features that community members are constantly asking for. One day they might go into movie production too. “We want BeScouted to become a social photography hub where all people that love photography could come for inspiration, knowledge and create art as such is photography,” states D.Leilionas. Success story of BeScouted has begun at LOGIN Startup Fair 2015, which was their first public event ever. “Preparation for the fair allowed pushing my presentation skills further as limited time for the pitch challenge required to purify all essential data and cut the crap about the product. No one has time nor desire to listen about you dreams and vision for half an hour as there are so many startups that want to speak and be heard,” remembers D.Leilionas. LOGIN Startup Fair is the event where team started talking to Startup Highway and later secured the pre-seed funding.